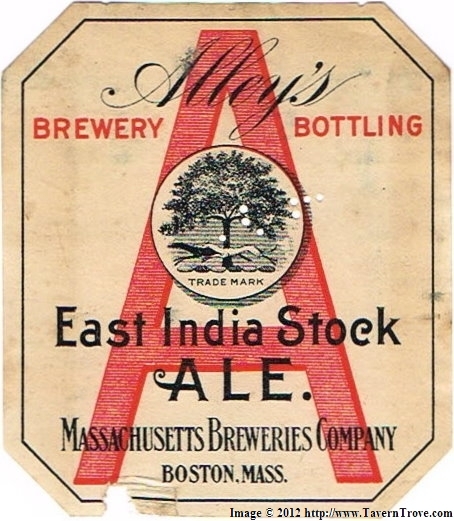 Above is a label of Alley’s East India Stock Ale – a c. 1900 version of what everyone interested in beer today knows as IPA. As gleaned from various online sources, John Alley immigrated to the U.S. from Ireland in the 1850s. He was already in his 30s and had worked in the family brewing business at home. After working with breweries in Providence and New York, he settled for good in Boston. John Alley was associated with at least two breweries in Boston. After his death in the 1890s, his two sons ran the brewery of his name, but it was merged into Massachusetts Breweries Company which continued the business for a time. This was one of the British investor-owned consolidations popular at the time. 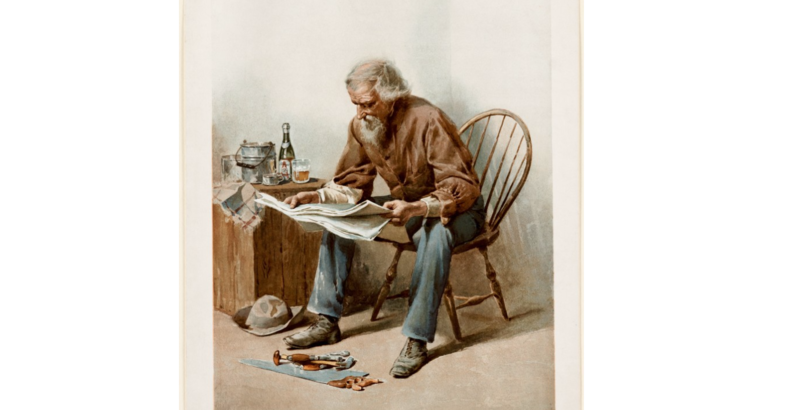 Below, from about 20 years before, we see a well-executed illustration of a man reading a newspaper with the same beer next to him. It was a colour proof for an Alley advertisement. If you look at the illustration carefully (follow link in my Note re Images below), you will see a colour code at the bottom which the artist used to guide his use of colour. This shows the commercial artist was seeking a high degree of fidelity for his use of colour. Also, you can see by magnifying the label that it is the same brand as shown in the later version of the label above. John Alley’s India Stock Ale was a lightish brown, quite similar to what I recall of Ballantine India Pale Ale before its demise in the mid-1990s. That beer of course originated in the 19th century. Numerous colour illustrations of 19th century pale ales, English and American, often show a brownish or light amber beer. Many brewing texts of the time advised to use as pale a malt as possible, but clearly colour varied somewhat and indeed the concept of pale was probably different to our conception today. One may recall that some American brewers used the term “extra pale” to denote a lighter-hued beer than pale connoted. Some IPAs of the day probably had a notably light colour, but a generally darker shade prevailed. In England in recent years, the semi-jocular, semi-jibing term “brown bitter” was used to describe bitter/pale ale in its post-war manifestation. The colour was usually achieved by combining pale malt with caramel malt, a “colouring” malt which darkens the hue and lends a sweeter taste. Brown bitter is often compared unfavorably to lighter-coloured, more heavily (and differently) hopped American versions. Alley’s India Ale was closer in colour to brown bitter than most of its namesakes today. I am aware that the label above does not state “pale”, but that is not significant IMO. Inserting “pale” on the label probably was viewed as making an already long name too long; it wasn’t that Alley’s beer was darker than usual for IPA, in other words. What did Alley’s beer taste like? Its hop signature was probably Cluster or rather one of its sub-types. The Cluster beers I’ve had are not really like modern IPA and lack their bright citrus top note. A Cluster taste is more half-English (woodsy, leafy) and half or less blackcurrant, which means a pungent vegetable taste. Some modern IPA has the so-called dank taste, which may well evoke an element of the old Cluster. If you blended a dank IPA with a reasonably hoppy “brown bitter”, Old Hooky, say, that might well resemble what Alley’s stock India ale was like. I should add, I now think Junius Henri Browne’s “aloes”-tasting New York lager was more down to the hops than the yeast. Note re images: the first image above is from Digital Commonwealth Massachusets via DPLA, here. The second is from Tavern Trove’s site, here. All copyright in and to the images belong to their owners or authorized users. Images are believed available for educational and historical use. All feedback welcomed. Excellent stuff, Gary … and note, too, this is one of the few examples of an IPA actually being called a “stock ale” (ie aged) on the label.